I'm not a huge fan of black eyeliner but I'm trying to get more into it since I have a million of them and black is always the shade given out as a sample size for a new product or brand. And so I found myself with a small size of this item in black! I love that it's a twist up so there's no need to fuss with a sharpener (or worry about remembering to bring a sharpener when traveling). The consist...read moreency is soft, as you'd expect for a "gel" product, which makes it glide on so easily for a beautiful, smooth line. I rarely line my waterline, but I have friends who do often and are always looking for a good liner for that purpose, so I always try it out. This one! This one is amazing. The liner glides right on then doesn't budge. 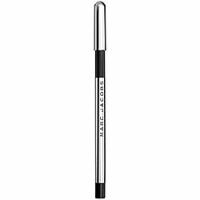 If you're looking for a perfect liner for your waterline, I think this might be in. Overall I really like this pencil. It's pricey, at $25 per pencil (currently on Sephora). My favorite liner has a very similar consistency for only $19 per pencil...but it is a pencil that requires sharpening. So when I start running low on my favorites I'll have to decide whether not needing a sharpener is worth the extra cost. I just might switch over! Given my past disappointment with my Marc Jacobs lip gloss, I'm pretty excited that this gel liner crayon performed so well. I first received a sample of the Marc Jacobs highliner in Blacquer in my 2016 birthday gift from Sephora. I am in LOVE with this eyeliner. I asked for any shade for Christmas and received Wavelength which is a beautiful midnight blue shade. The shimmer in the eyeliner is absolutely gorgeous, not too chunky of glitter, and the prettiest blue shade. I love how incredibly smooth and creamy the fo...read morermula is. I like putting it on the bottom of my waterline and putting a black liquid liner on my top lid to open my eyes. However, sometimes I like lining my top lid with the highliner as well. It's absolutely beautiful, lasts all day, and doesn't aggravate my contacts. Blacquer is also incredibly amazing as just a basic, shimmery black shade. Intense, beautiful, and longlasting. I want every color! !